Cardiac arrest is the abrupt and life-threatening loss of heart function. It is usually caused by an electrical disturbance that disrupts the pumping action of the heart, stopping blood flow to the rest of the body. Cardiac arrest is different from a heart attack in that it does not involve the blockage of blood flow to the heart. With that being said, a heart attack often causes electrical disturbances that trigger cardiac arrest. Cardiac arrest is a medical emergency requiring immediate cardiopulmonary resuscitation (CPR) and a defibrillator (which delivers an electrical pulse to the chest to restart the heart). It not treated immediately, sudden cardiac death can result. According to a report from the American Heart Association, more than 356,000 out-of-hospital cardiac arrests occur in the United States each year, nearly 90 percent of them fatal. Despite the high risk of death, early recognition of cardiac arrest symptoms, along with fast, appropriate response, can significantly increase the chances of survival. Though the symptoms of cardiac arrest may seem obvious given that the heart will suddenly stop, it can mimic other conditions depending on the cause. For example, there may be body convulsive movements that look like seizures, or you may presume that asphyxiation has occurred if a person starts gasping and collapses. 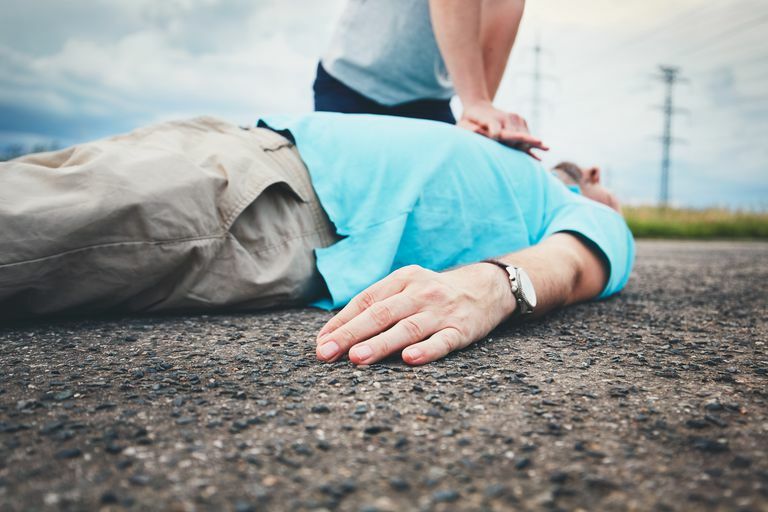 It is for these reasons that you need to recognize the three unmistakable signs of cardiac arrest if someone near you suddenly drops to the floor and passes out. Cardiac arrest stops the flow of blood to the brain. This deprives the brain of the oxygen and sugars it needs to function, resulting in the loss of consciousness (syncope). This will occur within 20 seconds of the heart stopping. Unlike other forms of syncope, in which a person may be suddenly or intermittently aroused, syncope with cardiac arrest will persist until heart function and circulation are restored. When the brain is abruptly deprived of oxygen, it will effectively shut down the autonomic (involuntary) bodily functions needed to survive. This includes respiration. With cardiac arrest, the loss of consciousness will be accompanied by the complete stoppage of breathing. Unless heart function and respiration are restored within five minutes, permanent brain damage can occur. At the onset of cardiac arrest, there will often be agonizing gasping motions, called agonal respiration, in which the person seems suddenly deprived of air before suddenly collapsing. Agonal respiration is not breathing per se but rather a reflex of the brainstem as it is confronted with a cataclysmic breakdown of the heart function. The absence of a pulse is the central sign of cardiac arrest. Unfortunately, this is the symptom often missed by lay rescuers who don't know how to find the pulse. It is for this reason that you shouldn't waste time with a pulse if the person has already collapsed and stopped breathing. In some parts of the country, even professional rescuers are being asked to ignore the pulse and initiate CPR and defibrillation if the person has stopped breathing. If a person has stopped breathing, call 911 and start CPR chest compressions at a rate of 80 to 100 beats per minute. Even if it turns out not to be cardiac arrest, CPR will not harm the individual. Early CPR with defibrillation is the only way to reverse a cardiac arrest. Speed is of the essence if a person is to survive. For every minute that passes without defibrillation, the chances of survival decrease by anywhere from 7 percent to 10 percent. If emergency services arrive and administer defibrillation, survival rates are as high as 49 percent. However, it is rare for a resuscitation to be successful if more than 10 minutes have passed without treatment following the onset of cardiac arrest. If you encounter a person who has collapsed and is no longer breathing, don't waste your time trying to figure out whether it is cardiac arrest or not. Simply act and recruit others around you to help. Cardiac arrest won't suddenly reverse itself. (It it were to, then it wouldn't be cardiac arrest.) Cardiac arrest requires immediate hands-on intervention, so there is no point in carrying someone to your car and racing to the emergency room. Those are vital minutes wasted. To this end, it important to learn CPR or take a refresher course if you were trained back in high school. Methods and rules have since changed, and most basic AHA-endorsed courses take no longer than two to three hours to complete. Benjamin, E.; Virani, S.; Callaway, C. et al. on behalf of the American Heart Association Council on Epidemiology and Prevention Statistics Committee and Stroke Statistics Subcommittee. Heart disease and stroke statistics—2018 update: a report from the American Heart Association. Circulation. 2018;137:e67–e492. DOI: 10.1161/CIR.0000000000000558. Fosbøl, E.; Dupre, M.; Strauss, B. al. Association of neighborhood characteristics with incidence of out-of-hospital cardiac arrest and rates of bystander-initiated CPR: implications for community-based education intervention. Resuscitation. 2014;85(11):1512-7. DOI: 10.1016/j.resuscitation.2014.08.013. What Are the Causes of Cardiac Tamponade?